Professor Dennis Falk has dedicated his academic career to teaching courses from a global perspective and to promoting global engagement at the University of Minnesota and nationally. His tireless commitment over his 42 years at the University of Minnesota earned him respect and recognition from his colleagues. 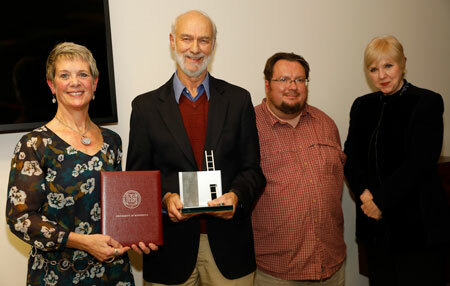 After receiving his Ph.D. in Educational Psychology from the University of Minnesota in 1974, Dr. Falk taught for two years at the University of Minnesota–Morris and joined the faculty at the Duluth campus in 1977. While at UMD he has taught more than 30 offerings of global issues courses, through classroom, online, and hybrid versions of Liberal Education, Honors Seminar, and first-year seminar courses. He co-chaired UMD’s participation in the American Council on Education’s Internationalization Laboratory, resulting in a Strategic Plan for internationalizing the Duluth campus, and chaired the committee to implement this plan. Dr. Falk participated in the American Association of State Colleges and Universities (AASCU) Global Engagement Initiative for ten years, chairing the Global Scholars group that represented twelve AASCU institutions for six years. This group focused on developing course materials on global challenges related to population, resources, technology, information, economics, conflict, and governance, including three editions of a toolkit to educate globally competent citizens, an e-book, and several versions of a hybrid national global challenges course. These materials have been adopted by numerous campuses and become embedded in modern global studies pedagogy. As a scholar and researcher on international education, Dr. Falk has written two books, published more than 20 articles in academic journals, and presented at numerous conferences. Over the course of the 30 years, he has been a valued trainer and inspiration to faculty by leading workshops and lectures on incorporating global perspectives and competency into pedagogy and curriculum. Dr. Dennis Falk has spent a lifetime educating and engaging academics to consider their areas of studies through a broader, global lens. His career and scholarly contributions have helped globalize the University of Minnesota and bridged gaps not just between disciplines, but between cultures and perspectives.